NUTRO PERFECT PORTIONS Adult Cat Food Trays allow you to feed your cat wet cat food without the mess of leftovers in your refrigerator. Made with real chicken as the first ingredient, this grain-free cat food contains no artificial flavors, colors or preservatives – only high-quality ingredients and nutrition in every serving. 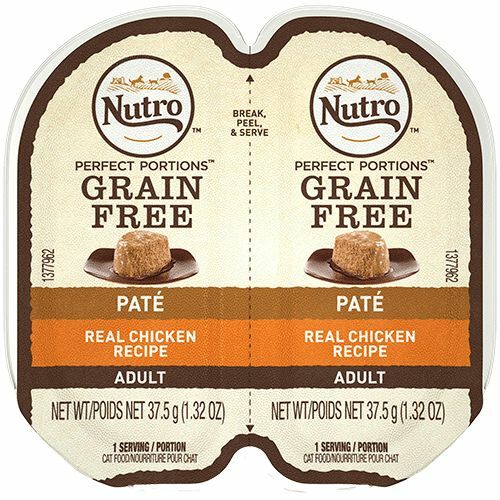 With NUTRO PERFECT PORTIONS Adult Cat Real Chicken Pate Recipe Cat Food Trays, your cat gets a fresh meal every time..
Chicken, Chicken, Chicken Liver, Pork Broth, Chicken Broth, Natural Flavor, Guar Gum, Potassium Chloride, Fish Oil (preserved with Mixed Tocopherols), Sodium Acid Pyrophosphate, Tetrasodium Pyrophosphate, Tapioca Starch, Salt, Taurine, Choline Chloride, Magnesium Sulfate, Sodium Hexametaphosphate, Thiamine Mononitrate (Vitamin B1), Vitamin E Supplement, Zinc Sulfate, Ferrous Sulfate, Manganese Sulfate, Potassium Iodide, Pyridoxine Hydrochloride (Vitamin B6), Copper Sulfate, Vitamin D3 Supplement, Folic Acid, Menadione Sodium Bisulfite Complex (source of Vitamin K Activity).